Make your Christmas Gift the one to be remembered and treasured! Send your child, or your loved ones a Personalised Letter from Santa! Just imagine how surprised they will be to see a letter from Santa, addressed to them and sent all the way from the North Pole. Their faces will light up reading a letter written by Santa personally and addressed to them. 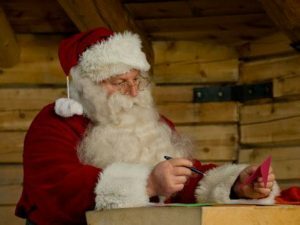 Each letter is printed on the high-quality paper and comes with a personalised Certificate for Good Behaviour, a Colouring Page and a signed photo of Santa, all despatched in Santa’s personalised envelope and postmarked from Santa’s Village in the North Pole..
You don’t have to be a child to receive Santa’s Pack! Why not surprise a family member, partner or even your boss. Most people are kids at heart, especially at Christmas. Imagine the giggles you will get! 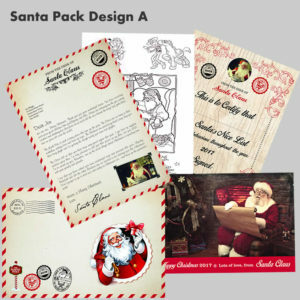 Order your Personalised Santa Letter Pack Today! We have 4 different letter packs (A, B, C or D) to choose from, and 4 different letter texts giving you 16 different combinations. This means that if you have more than one child, even if you choose the same letter design, they can each get a different message from Santa. 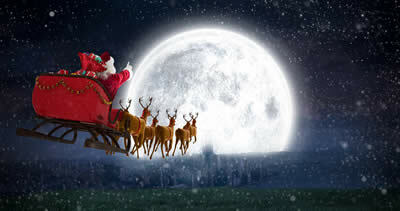 Each Santa’s Letter and the Certificate of Good Behaviour will also be fully personalised with the child’s name. Each letter pack is only €10 including VAT plus postage.